Rejuvenate is a home improvement product designed to clean and restore your wood flooring back to its flawless original condition. A big problem with Rejuvenate Floor Restorer is the film the product often leaves behind after applying it to the floors. You typically don't notice this during application, but a few hours later after the floor has fully dried you are stuck with a cloudy film that covers the entire floor. Fortunately, there is an inexpensive way to reverse this damage. Remove Rejuvenate floor restorer with vinegar. 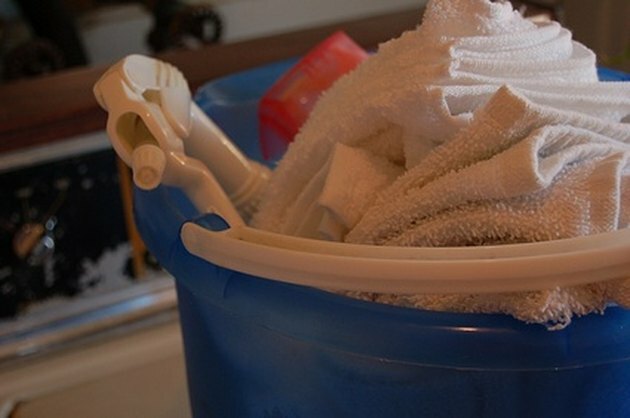 Pour 1 cup white vinegar and 1 gallon warm water into your cleaning bucket. Swish your mop in the mixture and squeeze the mop out as much as possible, making sure the water goes back into the bucket. Wipe this mop over your flooring, applying pressure as needed and repeating the application until all of the film appears to be removed. Let the floors air dry and examine the floor after all of the wood is dried. Repeat this cleaning procedure if any residue remains from the Rejuvenate Floor Restorer.